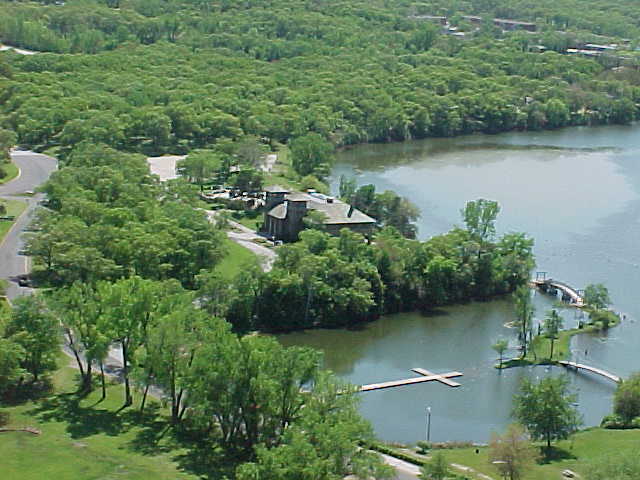 Marquette Park - Miller's little jewel on the lake. Marquette Park and the annexation of Miller see "From Bog to Park" on this website. 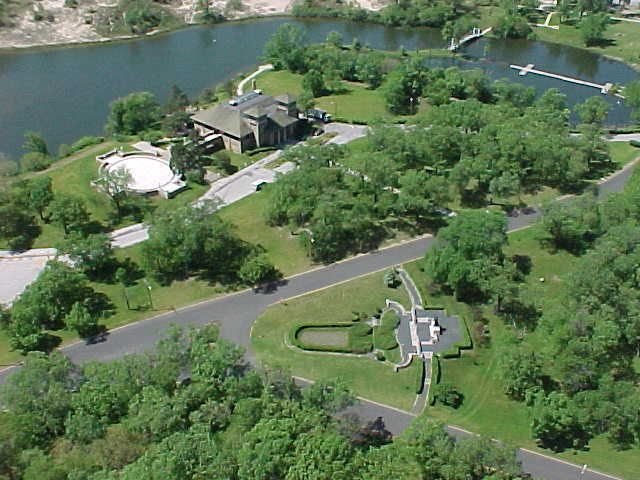 Marquette Park, originally named "Lake Front Park", has a storied past. Long before there was a park at this location it was not only the site of the mouth of the Grand Calumet river, but contained a town laid out first by Joseph Bailly, an early settler in the region. Indiana City remained on the maps for many years, but never had more than a few shacks on it. 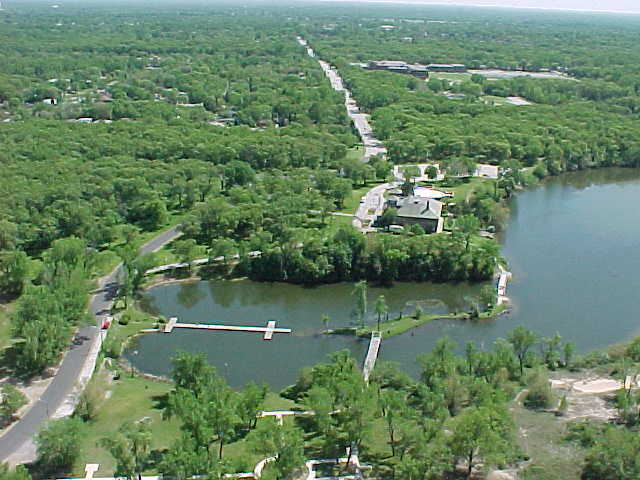 The land, a swampy wetland, had to be drained by local contractor Gus Strom after it was given to the City of Gary by United States Steel in 1919 for a park. It was a focal point in the controversy surrounding the annexation of Miller by Gary the years before. A close-up map of the park region on the Chanute Pages shows the original course of the river to the mouth of the Grand Calumet. For years people have believed that the mouth of the river, permanently closed in by US Steel when it built the Gary Works in 1906, was at the west side of the park, but testimony of two 'old timers', Bill Carr and Myron Esmiel, who died at the age of 96 in the late 1970's, puts the mouth at the east side, approximately where Montgomery Street is now. Like the Chicago river mouth, it was a low swampy area which in the dry season would often see lake water flowing into the river rather than out into the lake. From 1919 until 1928 the park was known Lake Front Park, and the pavilion as Lake Front Park Pavilion. In 1931 W. P. Gleason, the Superintendent of the Gary Steel Works and Superintendent of the Gary Park Department, commissioned Henry Hering of New York create a bronze statue of Father Pere Marquette to be placed at the gateway to the park. For more about Henry Hering and the B-25 collision with the Empire State Building in 1945, see below. By 1990 the park had fallen into serious disrepair other than the Pavilion. The Bath House had been closed since 1970 and there were no playground facilities other than a few broken down swings and a jungle gym. The concession stand was a wreck. Local citizens took charge and started a beautiful playground and a society was formed to restore the Bath House. There is more about that on the Playground Page and the Aquatorium Page. The concession stand was extensively re-done as part of the park's thirty million dollar renovation and is now operated as Carmella's Cafe. It's a great place to relax on a nice summer day and enjoy a hot dog or a cool drink. The City of Gary's Marquette Park page with lots of information. Or call 219-938-7362 for reservations. The Aquatorium's Website or call Jan at 219-938-1986 to inquire about reserving the space. Hidden Gems A nice article at Indiana Landmarks' blog about Indiana's cool historic places. Looking south over the lagooon: Grand Blvd and Wirt-Emerson in the background. 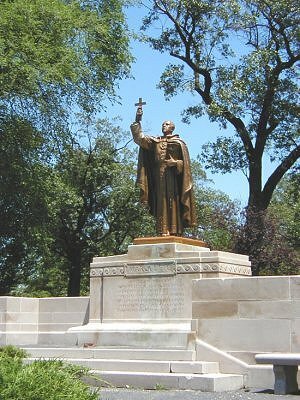 Henry Hering (1874-1949) was a renown American sculptor who was commissioned to create the Father Marquette statue at the entrance of the park. Search Smithsonian Institution's Collections more information about Hering's work. The The Henry Hering Award is a major award of the National Sculpture Society. Hering was a student of the sculptor, Augustus Saint-Gaudens at the Cornish Art Colony in New Hampshire. It was there he met his wife, Elsie Ward, a fellow sculptor. Hering also did a number of sculptures in Chicago. See for Chicago Loop.org's page. ChicagoLoop.org is the largest online gallery of photographs featuring Chicago's landmark architecture, sculpture and cityscapes. the Father Marquette Statue in the Park? On July 28, 1945 a B-25 smashed into the north side of the Empire State Building in a dense fog. It hit the 79th floor, plowing into the studio-apartment of Henry Hering, who was up in Scarsdale playing golf. There's a cool YouTube video of historic footage of the crash that briefly pans across sculptures that he was working on.